Hey, does anyone need any zucchini? I have plenty! I think I had better go on the hunt for a good zucchini cookbook. Is there one called 1001 Zucchini Recipes? I think that would work for me. Do you ever go hunting for zucchini and find that you missed one from the day before and now it's monstrously large? My husband brought in a couple this morning just this way and the only thing to do was to turn them into zucchini bread. I found a great recipe over at Lemon Basil that calls for coconut oil. I don't have any coconut oil but I do have coconut milk. 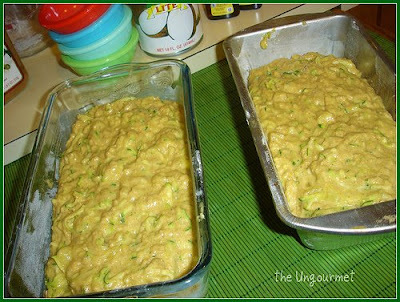 I decided to see if I could put a tropical twist on my zucchini bread. Grease and flour 2 loaf pans. 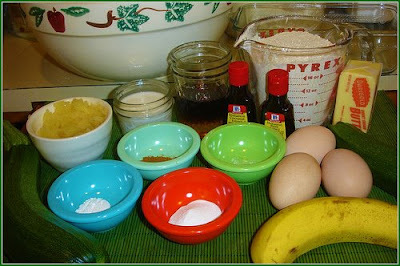 In a large bowl, mix together the zucchini, banana, pineapple, coconut milk, maple syrup, agave nectar, melted butter, extracts, and eggs. 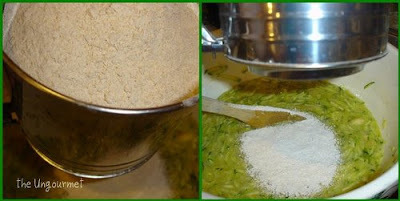 Sift together the dry ingredients and add to your wet ingredients. Split batter between loaf pans. Bake in a 350 degree oven for 50-60 minutes until toothpick inserted comes out clean. This was a big hit at my house. My mom stopped by on her way home from camping just as I took this out of the oven so I was able to share! I'm kind of a weirdo because I like to give people things when they come to visit. I sometimes go through my closet or my cupboards when my sister comes over to see if I have any shirts or lotions or whatever else I think might make her happy. Call me crazy! I never made zucchini bread before. It sounds pretty delicious. I've heard of zucchini brad, but have never tried it. I do love zucchini, so this has got to be something for me to try. Looks good!! 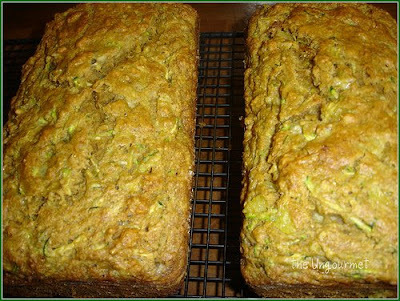 Zucchini bread sounds both healthy and delicious! I bet this taste yummy! I am bookmarking immediately. 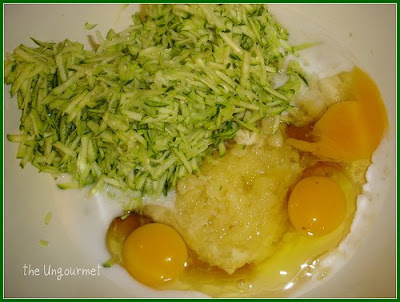 I love pineapple,coconut and zucchini, so this is a definate one to try. 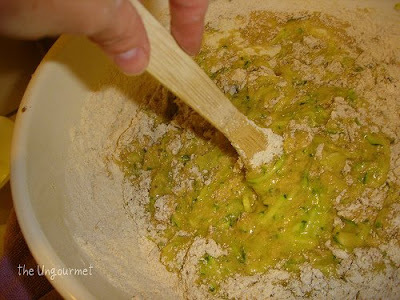 Zucchini bread is always tasty. I like the idea of putting coconut milk in it. Sounds like an absolutely wonderful way to use up your zucchini! I love all the flavors! Sounds delicious. I keep thinking I want to try growing zucchini but all I ever here is you get way to much of it. Funny - I saw coconut oil in the store the other day and was wondering what I could use it for. These look delicious with all the coconut flavors in them! This really is a double yum recipe. Thanks for sharing it with us. I love zucchini bread, but I never made it with tropical fruit before. The fruit sounds like a nice addition. How interesting! I am sure it is wonderful! You are so lucky to be harvesting things from your garden! I have a few things that are almsot ready. I can't wait! I love zucchini bread. This sounds delicious! Zucchini is so versatile! I just got a bunch from my grandma's garden and was trying to decide which zucchini recipe to make this time. I've had a zucchini bread with pineapple and coconut, but your recipe is a little different and sounds wonderful! I'll have to give it a try. ohh yummy Kim! and youre not a weirdo hehe I'll come visit for some pressies! Nice new header pic too :) I am working on our little project we discussed!! It looks beautiful and delicious. 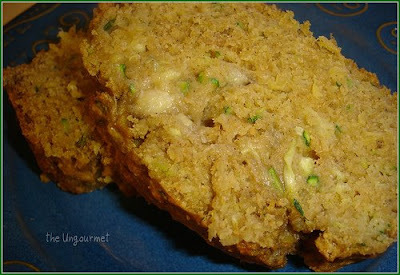 This zucchini bread version sounds delicious!! I am still waiting for zucchini on my plants, but will keep this recipe in the back of my mind when it comes time. I love your little colorful bowls in your pictures. Are they by chance Fiesta? That bread looks like it is very moist and full of flavor. I think I could manage that one OK! It's the only thing in my garden the dag-blasted birds haven't gotten to yet! I'm the same way, I love having people come over because it gives me an excuse to get baking! This looks SOOO good! I miss my garden, if I wasn't on the other side of the country, I'd be taking you up on that zucchini! I love the tropical twist. I'll have to give this a try! I made a chocolate zucchini cake from Cooking Light last week. It was awesome. I'll have to see how it compares to the cupcakes and this tropical bread. I always feel so sneaky hiding zucchini in cake!